Did you feel it? Report shaking and damage at your location. You can also view a map displaying accumulated data from your report and others. ﻿Scores of earthquakes have struck the Horn of Africa in the region known as the Afar triangle in this month of June cumulating in a volcanic eruption. May sky gazers claim as the approach of the most expected planet x or nibirue while the other attribute the movement of the comet Elenin which is approaching the earth with a rendez-vous on the 1st of September 2011, the new year of Ethiopia.. Geologically the horn of Africa is in movement since millions of years for the opening of the new ocean by splitting the region for creating a new ocean. The government of the dictatorial regimes of Ethiopia continues his project of mega dams on these dynamic fault lines even seen the volcanoes and the continues earthquakes . this will menace not only the local inhabitants by immediate danger but will have a direct consequences on Sudan and Egyptian populations. Is your family prepared for an M 5.5, Eritrea – Ethiopia region earthquake? Preparedness experts recommend that area families be equipped to survive up to 72-hours without public services in case of emergency. The simplest way to meet this minimum requirement is with a 72-Hour Survival Kit which will meet your family’s food, water, shelter, first-aid, light, heat, sanitation and communication needs. Read the United States Geological Survey’s full report on this earthquake activity atM 5.5, Eritrea – Ethiopia region. An important part of the USGS mission is to maintain and improve comprehensive earthquake monitoring in the United States with focus on “real-time” systems. The earthquake information above is preliminary and this event may not yet have been reviewed by a seismologist. A moderate earthquake struck near the Nabro volcano in Eritrea Friday, five days after the stratovolcano first sent an ash plume more than 15km into the air. Volcanic activity decreased overnight but a 5.5 magnitude earthquake on Friday morning could lead to a further increase in volcanic activity. Images from sat24 , however, show what appears to be a much smaller plume being omitted from the volcano. Volcanic activity has increased at the Nabro volcano in Eritrea, just four days after the stratovolcano sent an ash plume more than 15km into the air. The ash drifted westnorthwest over Sudan Thursday evening threatening to bring further disruption to air traffic in the east Africa region. Sunday night’s eruption led to some flight cancellations in neighbouring Sudan, Djibouti and Ethiopia, and saw a massive ash plume being carried as far away as Saudi Arabia, Israel, Turkmenistan, the Central African Republic and Egypt. The below MODIS Terra 1km True Colour satellite image, captured Thursday afternoon, shows the ash plume drifting hundreds of kilometres west of Nabro. Today an earth quake of 4.5 – GULF OF ADEN – 2011-05-31 00:36 UTC hit the gulf of Eden streaching to Afar triangle. Today’s earth quake of magnitude 4.4 moved the Red Sea which is a prelude for the making of Eastern African ocean. It has a direct impact on the different dams which are in construction in the Horn of Africa, especially that of the Millennium “Death Dam” in the the Nile region of Ethiopia. This the second earth quake in the region since the start of the Death Dam. On March 31 st Magnitude 4.6 – hit Eritrea, Ethiopia and Djibouti border on Afar depression. This is the region where the new ocean is in formation. It is high risk for the population in the area to peruse damming by the dictatorial regime of Ethiopia especially the Omotic population in the rift Vally. The Afar region of Ethiopia is plate form of a living volcano preparing the breaking of the continent for the creation of this new ocean of Ethiopia. It takes only a dictator to try to build dams on the splitting plates of Eastern Africa trying to connect two separating plates with with a cement. Last year a 26 km tunnel collapsed on the Omo Dam known as Gibe due to the earth’s movement on its diverging eastern African plates . In the Ancient Geez ( Ethiopic) the language of the ancient Abyssinian astrological Codex, known as Awede Negest, Kokeb is a star body rather than Moon or Sun or a planet or comet. This is one of the kokeb that is waited to arrive to words our earth on September 11, 2011 on the Ethiopian Enoch’s (ሄኖክ)* calendar New Year. The Ethiopian calendar is predates that of the ancient Egyptian with certain similarities to the Copts by error it is called Julian calendar too. That day it will be September 1, 2004 seven year and eight months behind the Gregorian calendar, when our planet will be close to the Star. It is a calendar made by the ancient Abyssinian star gazers. Ethiopia is located inside the tropics and is the closest place to the sun than any where on earth for observing the sky in the naked eye. Ethiopians of old times were raised up studying heavens from plate of water or hole filled with water on the ground than looking up though a telescope. 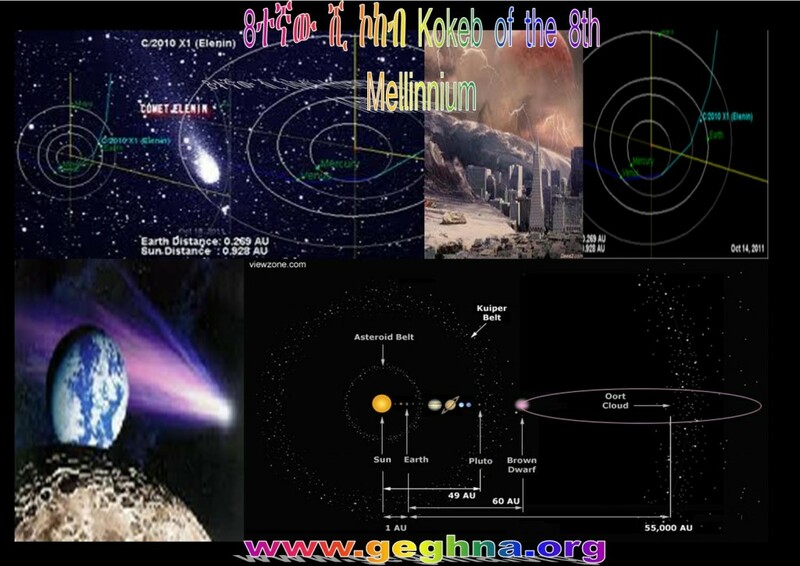 The 2and important date 11/11/2011 of Elenin falls significantly on the 1st date of the Ethiopian 3rd month Hedar 1, 2004 having a great sign in the Abyssinian astrological book Awede Negest. In Ethiopia is counted the 8th millennium though the dictatorial regime try to reduce it to two millennium thus confusing the population not to follow the stars. On that day the “Comet” known to the ancient will cross the ecliptic on line up with Mercury, the Sun, and the Earth. It will be getting close to Earth’s proximity that its orbit will reach during its turn around the sun. The Russian astronomer Leonid Elenin in December 10, 2010 observed the “Comet” which he gave his name. Many claimed NASA knew it earlier and kept in silence to keep the excitement down. 9/11/11 is the date of the arrival “Comet/ planet /star/” of Doom or Gloom is not Hoax but rather a scientific fact recognized by many astrophysicists and NAZA. When the Kokeb was first discovered in December 20 last year, there was no concern of it coming close enough to the Earth the path seems to be getting closer to Earth than they originally projected, could there be a Comet Elenin Collision Course with Earth? Most of the astrophysicists and NAZA have identified the current path of Elenin with some degree of accuracy. Though the length of time to complete its ellipse is not so well defined but based upon one set of data, Elenin s period could be 11,000 years. Solar and Heliospheric Observatory SOHO – is a specific spacecraft that was created to observe the Sun, a cooperative between ESA (European Space Agency) and NASA. SOHO has been observing Comet Elenin for a while.
. According to Hopi’s prophecy, the Blue Star Kachina acts as a warning, an alarm bell that announces the imminent arrival of the Red Star Kachina. The story is about the cyclical nature of life; it is a story about humanity forgetting to remember its purpose; it is a story of destruction and purification; it is a story repeated a thousand times throughout history; and as always, it is ultimately a story of renewal. The Sumerians 6000 years ago referred to an ancient planet called Nibiru, the 12th planet of our solar system. It was a rogue planet, causing havoc in our solar system as it passed through because its orbit was in the opposite direction of the planets. When it appeared, it did so in the shape of a red cross in the night sky before flipping the Earth’s poles. Nemesis of the Greeks ? The theory of a companion sun is not new. It has often been described as Nemesis, after the Greek figure in mythology. The mythological Nemesis was the spirit of divine retribution against those who succumb to hubris, vengeful fate personified as a remorseless goddess. The name Nemesis is related to the Greek word meaning “to give what is due”. Nemesis is now often used as a term to describe one’s worst enemy, normally someone or something that is the exact opposite of oneself but is also somehow similar. For example, Professor Moriarty is frequently described as the nemesis of Sherlock Holmes. “Opposite yet similar” is the perfect description for a companion to our Sun. But the name Nemesis also implies a sinister nature. Will this new Nemesis be beneficial or harmful to our lives? “Scientists at places like NASA and famous observatories have deflected inquiries about the discovery for a few years now, mainly because they feared being associated with these “fringe” theories. But like it or not — it has happened. Well… according to a team of Spanish artronomers who call themselves the StarViewer Team. Concerning Elenin little is known about this comet because of its relatively recent-discovery status, therefore, information regarding its size, mass, and orbit still vary widely or are missing altogether due to a lack of observational data. Still, astrophysicists have been plugging away at Elenin ever since it was discovered last year. NASA’s Jet Propulsion Laboratory has an interactive diagram of Elenin’s orbit with the known information about the object plugged into variable positions. What is known is that Elenin is scheduled to make its perihelion turn around the sun in August of this year . Shortly after making its u-turn, Elenin will perform a fly-by of Earth, coming within 21,000,000 miles of Earth. As a point of reference, the moon is roughly 240,000 miles from Earth. Space distance is measured in astronomical units [a.u. ], with 1 a.u. being the distance from the Earth to the sun. Elenin is currently estimated to pass within 0.24 a.u. of Earth after it makes its turn around the sun it suppose to begin heading back out into space. From October 10-24, 2011 comet Elenin is forecast to be within 0.25 a.u. of Earth, according to NASA JPL diagram. *An Enochian year is completed in 364 days, Enoch 82:4-7 and Jubilees 6:23-28. More precisely, a 365-day-solar-year and the 365-year-solar-cycle appear as a 365-days-and-years single term. From the three books of Enoch, a curious 364-day length of calendar year lends new insight by reserving the last day of the solar year. *65 is the year Enoch lived on earth before transfiguration according to the Bible.